Over the development of MWL: Over a hundred design documents were made. From to do lists, to artwork, concepts, and even original music. However, keep in mind, this wasn't always called MWL. 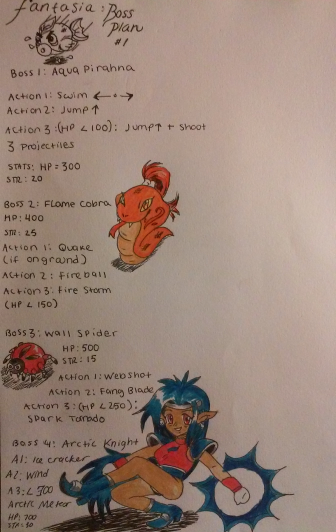 Back when the game first began, it was known as Fantasia:Rise of a Legend. Within volume 1 of the Archives, 9 images will be shown. 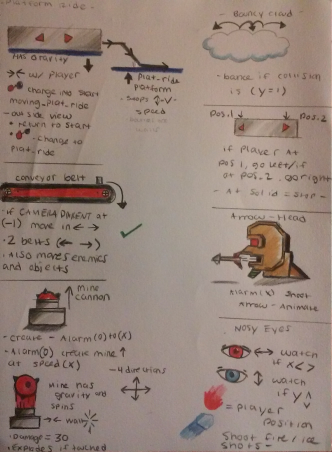 These are a small chunk of design documents featuring some gimmicks,scrapped,bosses and hazards. This is modern Lydia. Although, this version didn't make it as her final incarnation, some of her designs were passed down to other characters such as the gem seen on her forehead. That is now passed down to Bai. 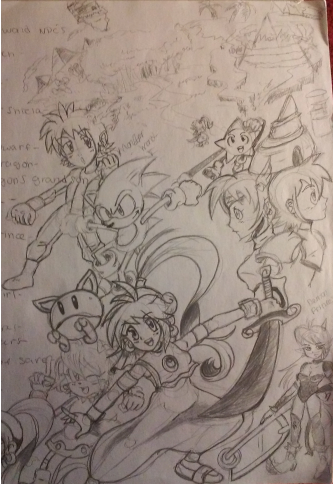 Long Before a decision was made on what this game should be, it was originally supposed to be a crossover of several characters such as Popful Mail, Sonic The Hedgehog, Alex Kidd, Mario, Mega Man, Princess(From Magical Pop'n), and an assortment of other characters. Although a demo build does not exist with Sonic and others, they were once playable during the development process. Another concept was to choose between a boy character or a girl character similar to how Monster World 4's design was supposed to be. Since 5 users submitted characters with 3 of them being male characters, this idea was scrapped. 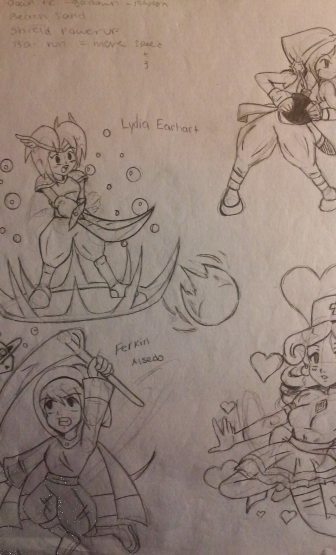 Character concept art that features Lydia, Ferkin, Nurse Gloria, and Zyla Hawk. This is Lydia's past form with the baggy pants and ability to shoot magic from her sword. Ferkin is casting a dark magic spell. Nurse Gloria is a scrapped NPC character that was once going to be playable. 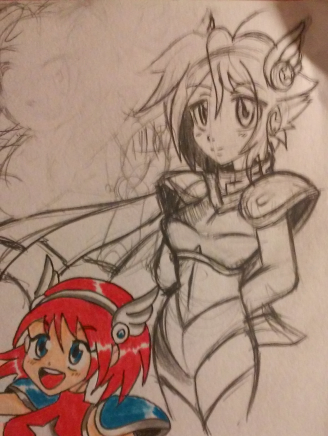 Zyla was a once planned playable pirate character, but was scrapped in mid-development. She had the ability to use bombs and daggers. This is Lydia's true final design and is the one featured as of the 2017 Conceptual demo. She appears now as more of a warrior than her previous designs. With a big bow on her head, small armor, and an assortment of other things, Lydia appears more lady-like than ever before. Another conceptual design for Lydia. It was really difficult trying to figure out if she should be an adult or a child. If she was a child, she would be 10. For an adult, she would be 20. The decision was to place her at the tender age of 13 as that is officially when you become a teenager, so many things are new to her. Its this concept that makes the world around her fun to make because she knows nothing about the world beyond the city she was born in. So how exactly will a 13 year old affect the lives of people she will encounter on this journey? You'll have to stay tuned for future releases to find out. Love them all <3. I love your style :^D. Any chance of having small image cutscenes or something? It brings me joy that you love my work:) Thank you so much bud. Sometimes I even wonder why I stopped drawing in 2014, but I plan on picking it back up again for the sake of future projects and concepts. And yes, I do have lots more to show besides what is shown here. This is only volume 1 of images. More are yet to come. Some have Bai in them as well and I know you'll be happy to see that. I actually was looking for Bai while taking a peek at them, so yeah I would love to. But I really love the different designs for Lydia. And there is a lot of progress in your style-- I didn't knew you drew this good :^D! All these years of watching this game and just found out. So yeah! Keep on drawing! I'll work on it this week. 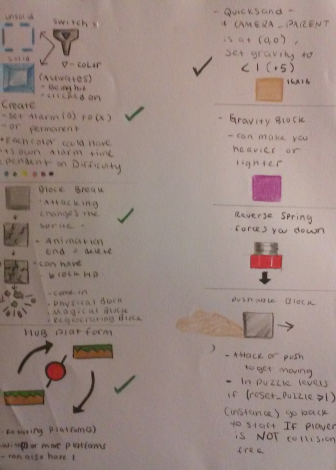 I spent hours digging through everything to find bits and pieces of the design documents. Most likely a new set of archives will be up soon. 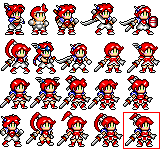 Not only did Lydia's design change in art, but if you take a brief look at this, you'll see how many times I had to redesign her in pixels. If often took going back and forth to do so. Also, now that I know how to change costumes in game, characters may get a 2nd costume after the main game is done. I guess the thing was I was afraid to show my work because I though it was mediocre compared to what others can do, but I realized that it was an unwise decision to be so focused on others talent that I neglected my own. And thanks for your support, its comments like these that keep me pushing forward no matter how bleak things may seem.